R.A.P MUSIC Produced by El-P Out NOW On Williams Street Records! Buy your copy from iTunes: ow.ly/aVqFZ Hear more tracks & Buy Album at: http://adultswim.com/rapmusic Nearly a decade deep in the rap game, Mike has released five critically hailed records and won a Grammy for best Rap Collaboration with Outkast for the song “The Whole World.” But, in no uncertain terms, Mike will tell you that R.A.P. Music is his finest accomplishment. He’ll even call it a “classic.” Of course, every rapper calls every one of their albums a classic. The only difference is that Mike’s right. Simply DOPE. I love tracks getting harder and harder slowly. RONALD WILSON REAGAN 666 !!!!!!! tell um killa killa mike! It's so refreshing to hear Obama called out as a continuation of the same system. Jay-Z is doing Pitchfork interviews talking about how brave Obama is for supporting gay marriage. But Mike knows he'll never ever do anything to stop the wars and or address economic inequality. oh you said it. respect. 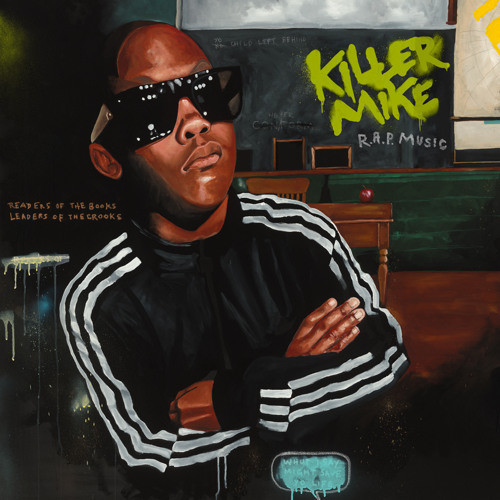 Killer Mike is a KILLER! Amazing... It's like a Dan Carlin inspired hip hop song!